Request your free online marketing consultation today! Here at SEO Web Live we look forwards to hearing from you and responding to any queries you may have. Simply fill in the form below and we will get back to you shortly. Paul is an expert SEO who is results driven. He helped our clients achieve their desired online goals by utilizing successful SEO techniques to drive targeted traffic to the websites and convert them into new customers. 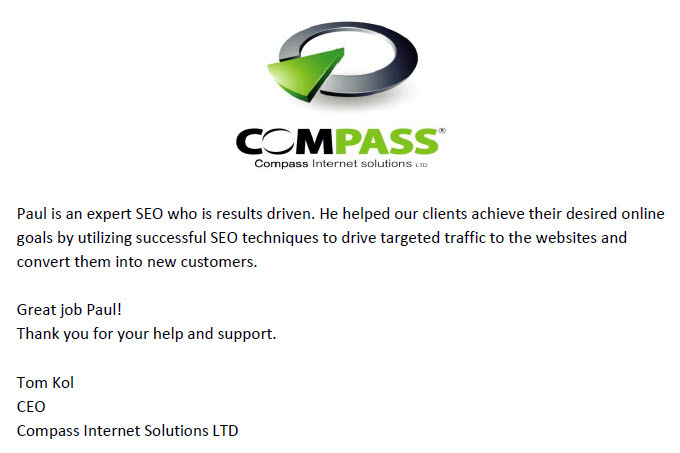 See scanned SEO testimonial here. We received SEO consulting services for one of our main brands and websites. The website was optimized and rose in positions on Google which created more business for us. We received weekly website analytics reports and monthly Google positions reports which helped us see the progress. We thank Paul for investing the time and getting us the results we desired. We were very satisfied with results that SEO Web Live helped us achieve. They created online paid campaigns on Google and Facebook which targeted the exact audience we wanted. Our book sales increased and our customer base expanded.